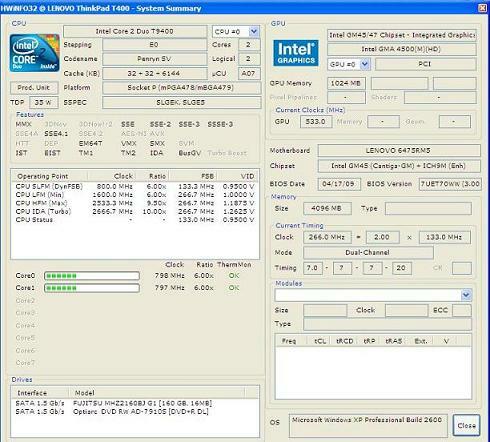 Previously we mentioned about PC Wizard 2008 and TinyResMeter that can dissect and display PC system information, now there is a similar utility named as HWiNFO32 that can perform the same but at a relatively smaller foot print (compared to PC Wizard 2008) while able to provide more comprehensive hardware and software details as compared to TinyResMeter. Once installed and launched the utility, it will scan and display as much of system information as possible in system summary button, covering CPU, GPU, motherboard, platform BIOS version and details. For instance, users will be able to find the CPU clock speed, cache size, TDP value, features, Clock ratio, FSB speed as well as existing core frequency that the system is running at. Similarly on GPU portion, the utility will able to display chipset name, GPU memory size, memory channel (single or dual), timing as well as BIOS and OS used in the system. All these information can be extracted into report format in either XML, HTML, MHTML or short text reports for data collection and compilation. That is not all, the utility allows users to run benchmarking test to measure CPU, memory as well as Disk Drive tests and the results can be compared to other competitors’ solution in PC market for a easy and fast comparison even for non-technical end users. Last but not least, users can easily pull up data collected by digital thermal sensors to ensure the motherboard and whole PC system are in healthy condition without exceeding the maximum allowable thermal rating. If you are still wondering what your PC system and hardware peripherals’ specifications are and curious about how well it performs as compared to other’s CPUs in the market, no harm to try this utility and see how much it can help you. HWiNFO32 consumes less than 2MB and is compatible to run with all flavors of Windows Operating System suitable for both home and office environments.